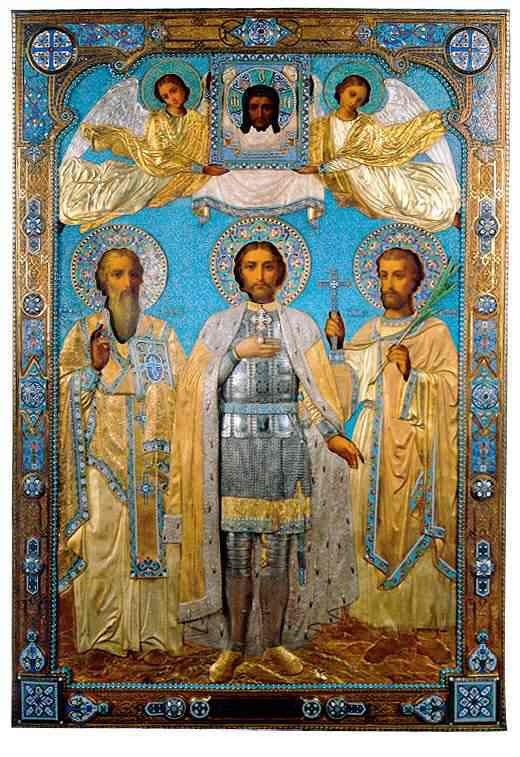 This beautiful icon is located at the Hermitage, it depicts St. Alexander Nevsky along with St. Titus and St. Polycarpus. He was born on May 30, 1219 at Pereaslavl, a fief of his father, Prince Yaroslav, who was of the house of the Grand Prince of Suzdal. He spent the first years of his life in this small city which stood on the shores of a lake among the trees and meadows and was defended by a simple wooden palisade. His parents, real country nobility, were very devout, they contributed to the adornment of the cathedral and of a monastery established nearby on a hill and they were present at all the divine services celebrated in a small chapel which was connected with their residence by a wooden arcade. Alexander was scarcely three years old when his father was elected prince of Novgorod and went to live two leagues away from this ever unruly city in order to preside over its fortunes. Here again the role of the Church seems at first to have been predominant. It was in the cathedral of St. Sophia itself that three times a week the council of boyards, the real masters of the free city, met together. But dissension reigned in this strange republic, incessant disputes occurred between the rich merchants and the craft guilds, between the nobles and the prince. As a child, Alexander was present at stormy scenes and at scuffles between citizens and his father's followers. On four occasions he witnessed his father's departure for his fief at Pereaslavl whence he was recalled again at once by his new subjects. At an early age Alexander thus came to know the horrors of internal dissension, the dangers which threatened his country, and became aware of the duties incumbent on its rulers. He developed a profound spiritual life. After mastering the first rudiments of his education he would become absorbed for hours at a time in reading the Old and New Testaments. At the age of nine he was left alone at Novgorod with his elder brother Theodore, under the guardianship of certain nobles. His father, who had grown disgusted with his office, only returned for short periods and at one time the children themselves were obliged to flee under the leadership of a tutor. Meanwhile, Theodore, the older brother, died prematurely on the eve of his wedding, and when his father, in 1236, became by right of succession Grand Prince of Kiev (that is, ruler of all Russia) to Alexander fell the fief of Novgorod. The adolescent found himself faced with terrible responsibilities. The following year occurred the great Mongol invasion of the north of Russia and it was only by a miracle that the barbarian hordes were halted before the walls of Novgorod in March 1238 and made their way back to the steppes. Alexander, called on to reign and to fight, henceforth devoted his whole life to the service of the nation; bowing to the divine will he sacrificed himself for the common good. But he did not renounce the world. In 1239 he married the daughter of the Prince of Polotsk, a feudal neighbor. He enjoyed the pleasure of the chase and hunted the bear armed only with a sling. But his duty always took first place with him. Statue of St. Alexander Nevsky located in St. Petersburg. His memorable reign at Novgorod lasted for sixteen long years. Alexander made it his business to combat the separatist tendencies of the city and to strengthen its links with the central power. He endeavored to weaken the economic and political power of the boyards by a direct intervention in the administration of justice, by taking away from the important merchants the right of levying a tribute on furs over an immense region of the north for their own profit and by abolishing other unjustified privileges. 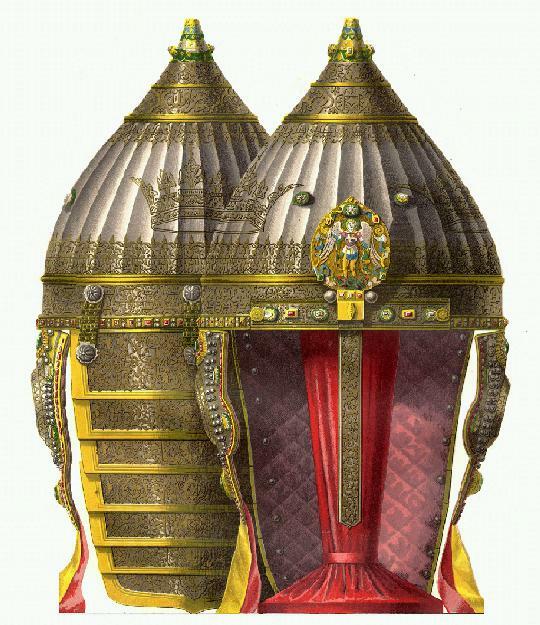 But it was particularly as the defender of the material and spiritual patrimony of the nation that he has rendered his name immortal by his victorious resistance to the Swedes, the Teutonic Knights and the Lithuanians and, subsequently, when he became Grand Prince, by establishing an acceptable modus vivendi with the Mongolian overlord. 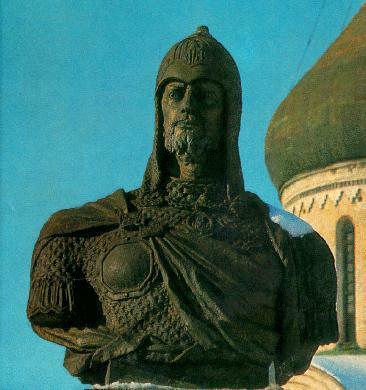 His first victory over the Swedes, won in 1240 on the banks of the Neva, had world-wide repercussions and earned for him the name of Nevsky with which he is known to history. In order to obtain possession of those parts of Russia which had not fallen under the dominion of the Tartars and to cut the only outlet of Novgorod to the Baltic Sea, King Erik had gathered together a great army and placed it under the command of his son-in-law Birger. The King derived some encouragement for his undertaking from a Bull of Pope Gregory IX, addressed in 1237 to the Bishop of Upsala and summoning the Swedes to a crusade against the Finns who had abandoned their Catholic faith under the influence of their neighbors (that is, the Russians). The interpretation of this papal message was clearly somewhat forced, but it appeared to furnish the King of Sweden with some justification for his aggression. Alexander had foreseen the danger. In 1239 he had organized the defense of the routes from Novgorod to the sea and had placed the defense of the routes from Novgorod to the sea and placed his sentries on both sides of the Gulf of Finland. Pelguse, the chieftain of a local tribe, a convert to Christianity, warned him of the disembarkment of the Swedes on the banks of the Neva, and at once the prince hastened to meet them after he first asked the blessing of his Archbishop. Reviewing his troops before he set off he uttered the phrase, an allusion to the Psalms, which has remained famous: "God is not on the side of force, but of the just case, the pravda." Before coming up with the enemy, Alexander's troops had a difficult march before them over marshy land. Pressing on swiftly they arrived on the banks of the Neva which were still shrouded in mist. A few hours earlier at dawn Pelguse had experienced a curious vision. He saw a boat with mysterious shapes on board coming slowly down the river; it was the holy princes martyrs Boris and Gleb, amid their heavenly oarsmen, coming to the help of their "brother Alexander". Battle was joined at sunrise. It caught the Swedes unawares; they were convinced the Novgorod forces, deprived of the assistance of the Suzdal army, recently destroyed by the Mongols, would be in no position to offer them resistance. Birger was installed in a gold embroidered tent as were many of his knights, but the main body of troops had not yet disembarked. The Russians carried out their attacks with lightning like rapidity while Alexander in person wounded Birger with a blow from a spear, his men at arms cut the bridges joining the boats to the river bank. Panic seized the Swedes and the battle ended with their flight in utter disorder. Similar scenes occurred in the following year when Alexander inflicted total defeat on the Knights of the Teutonic Order who had acted in concert with the Swedes. They had seized Izborsk, broken the truce of Pskov and burned the outskirts of that city before the boyards opened the gates to them. Having crushed the Swedish offensive, Alexander was ready to go to the aid of Pskov, but prevented by the boyards from carrying out this plan he withdrew to his father at Pereaslavl. It was not long before he was recalled by his subjects who at last had realized the true extent of the danger. He returned with regiments raised in the territory of Suzdal and set off for the western frontier at the head of all the forces still remaining to Russia after her conquest by the Mongols. Alexander's fame as a warrior and saviour of his people is best remembered in the Lake Chudskoye battle. The steel clad Teutons driving a wedge through the lines and the Russians retreating on to the ice of the lake and attacking the enemy on two flanks, bringing down hundreds of knights and putting the others to flight. Alexander's victory was complete and the German advance was arrested for centuries. On the 5th of April 1242 the very existence of Russia was saved. Once again those who were present at the battle thought they saw heavenly armies appearing to bring aid to Prince Alexander. To preserve the integrity of the frontiers of Novgorod it only remained for Alexander to put an end to the invasions of the Lithuanians who in a poorly defended region had for many years past waged a kind of guerrilla warfare. In 1242, as the Lithuanian pressure increased, Alexander destroyed, one after another, seven of their detachments by using in a defensive war his tactics of lightning attack. In 1245, having repulsed a further invasion, he no longer had anything to fear from this quarter. Lithuania gave up annoying her neighbors. But after 1246, quite new tasks occupied his attention. The second period of his life was beginning; henceforth his eyes were to be turned to the east. His father, the Grand Prince Yaroslav, had just died on his way back from a journey to Karakorum where he had been summoned by the Grand Khan and presumably poisoned, that, at least, is the assertion of the Russian chroniclers. The matter of succession could not be settled without further intervention of the Tartar leaders. For reasons that are unknown to us it is not the deceased prince's oldest son but Alexander who was summoned, together with his brother Andrew, to appear before the Asiatic overlords. He was faced now with a tragic dilemma. Was the conqueror of the Swedes and the Teutons, was the hero of the Neva and Chudskoye Lake, to adopt the attitude of a humble vassal and to recognize openly the loss of Russian independence, thus insulting the death under torture already suffered by some of his near relations? Alexander, an Orthodox prince, thinking solely of the good of his people preferred to submit to the divine will and took counsel of the higher clergy. Metropolitan Cyril gave his approval to the decision to leave, on the condition that he worshipped no idols and did not deny his faith in Christ. Collaboration with the tartars was indeed at the moment an historical necessity, - the nation could count on no help from outside, the attitude of neighboring countries was entirely hostile and the worth of her own warriors, which was sufficient to confront enemies as courageous as the Swedes or the Teutons in equal numbers, did not amount to much when faced with the hordes of nomads who carried all before them as they advanced by their tens or even hundreds of thousands. Subsequently, the Russians have been able to recognize the great services that Alexander rendered them by sacrificing his pride on the alter of the fatherland. The Mongols themselves were profoundly impressed by the conduct of a man whose reputation had reached them some time beforehand, they granted him the honors due to his rank and spared him the ordeal by fire and worship of the idols. Nevertheless, they obliged him to undertake the interminable journey to Karakorum through the deserts of Asia and only allowed him to return to his native land after three years' absence. on three occasions during the following years, Alexander had to return to his master's camp situated to the north of the Azov Sea to arrange current affairs and also to implore their mercy for the people under his government. 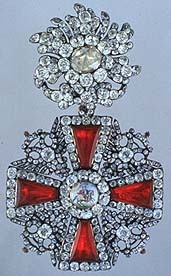 After the Order of Saint Andrew, the most important order of the Russian Empire was the Order of Saint Alexander Nevsky. Peter the Great founded this order in 1725 to honor those who had distinguished themselves in battle. His elder brother was dead and his second brother Andrew had taken flight after an attempted rising which ended, as could be foreseen, in terrible reprisals; Alexander had become the Grand Prince of Russia. It was his concern now to prevent further invasions, to inspire the Grand Khan with confidence, to serve as intermediary between him and the Russian people, and to prevent rash insurrections even at the price of painful concessions. This superhuman task was by no means made easier by fresh attacks from Sweden, against which, in 1258, Alexander was obliged to conduct a new campaign, victorious like the first, and still less by the incessant unrest in Novgorod which, in 1259, assumed an especially serious character when the Tartars were conducting a general census of the population. Only the personal intervention of the Grand Prince who went there at the head of an armed detachment and lavished presents on the tartars, succeeded in preventing terrible bloodshed. Alexander allowed himself to be discouraged by none of these difficulties. Having established himself at Vladimir, the ancient city of Suzdal, famous for its numerous churches, he repeopled the villages deserted by their inhabitants, rebuilt the churches and monasteries and reopened the law courts. He arranged a marriage between one of his sons and the daughter of the King of Norway in hope of thus counterbalancing the power of the Swedes. In the solitude of his high position he found a friend and counselor in the person of the Metropolitan Cyril, a great churchman, who was able to understand and advice him; Cyril had seen Kiev and Lavra of Pechersk in ruins; like Alexander, he hoped to spare the nation further misfortune. In 1242, when the exactions of the Tartars provoked once more a popular rising, Alexander undertook his fourth journey to the Tartar headquarters in order to ward off a punitive expedition. For a whole year he did all in his power to pacify the Great Khan and his henchmen; he even succeeded in dissuading the Tartars from their plan of raising Russian regiments for a war against Persia. But he had come to the end of his strength. On the return journey, over roads made difficult by the autumn rains, he died at a monastery in November 1263. Before his last breath he gave up his princely rank and the glories of this world in order to put on the habit of a monk. "The sun has set over the land of Suzdal", exclaimed Metropolitan Cyril in announcing the death of their leader to the dismayed people. 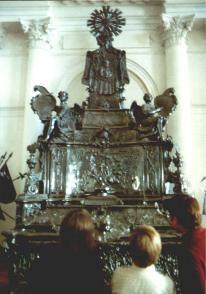 Alexander's funeral took place with great solemnity. Legend asserts that when he was placed in the coffin and as the Metropolitan endeavored to place between his fingers the prayer of absolution, according to the custom of the Orthodox Church, the dead man opened his hand and seized the sheet of parchment. Subsequently, numerous miracles occurred at his tomb. He was canonized locally in 1380 and by the whole Russian Church at the Council of 1547. Five centuries after his death, following the victorious outcome of his war against Sweden, Peter the Great caused the relics of St. Alexander Nevsky to be translated to the new capital of St. Petersburg where they lie today at the Lavra that bears his holy name. Sarcophagus of St. Alexander Nevsky located in St. Petersburg. It is to St. Alexander Nevsky that the Russian people are wont to address their prayers at times when great misfortunes befall the nation and threaten its existence. Alexander is venerated as a saint without having been a hermit, an ascetic or a martyr. "God has glorified his righteous servant," writes the chronicler, "because he worked much for the land of Russia and for Orthodox Christianity." Through the prayers of Saint Alexander, may the Lord Jesus Christ have mercy on us. Amen.